Not sure who to give credit to for this as it was forwarded to me via email….EMAIL, people?! Any time I see it on tap, I can’t resist. 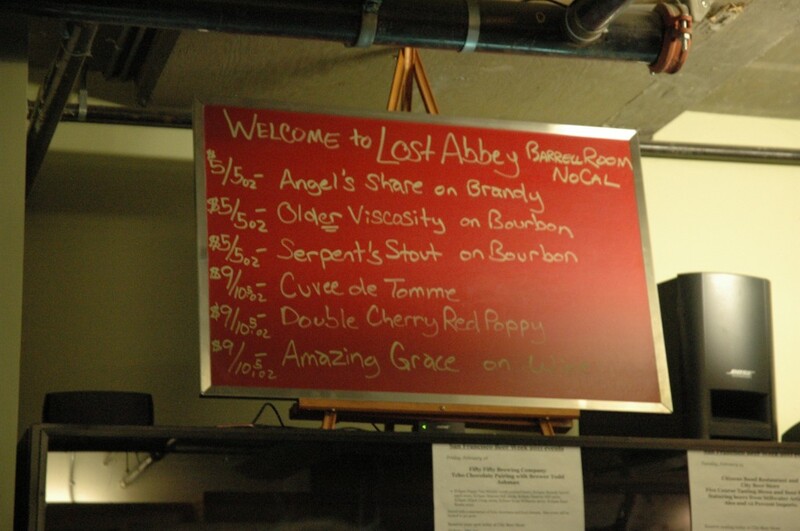 The 2010 Lost Abbey’s Angel’s Share does not disappoint. So much better on tap than in a bottle, do not pass this up if you see it! Love this minimalist design by Justin Helton. Just one example of awesome beer glassware. 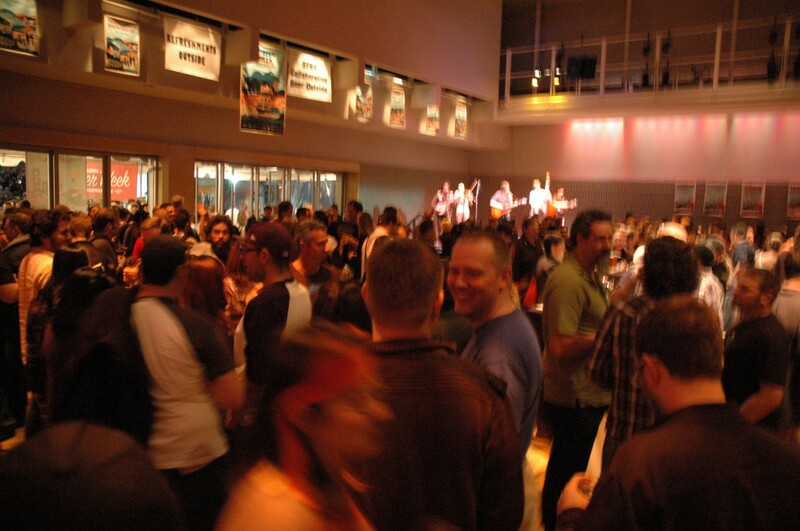 It’s still SF Beer Week! Woo hoo. Last night we decided to check out City Beer Store for Meet The Brewer: Lost Abbey and Port Brewing. 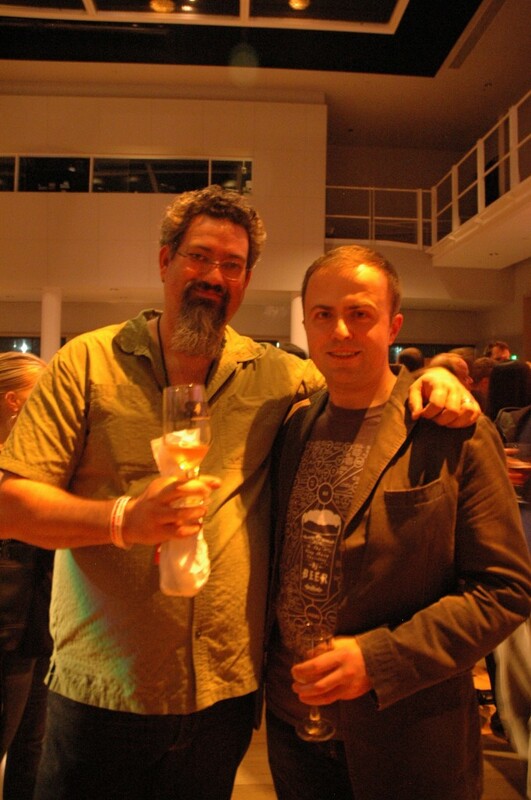 Seeing as I’m a huge fan of the beers they make (their Angel’s Share is one of the beers that made me truly fall in love with beer) and I knew it would be a great setting to drink some of their beers and meet the legend that is Tomme Arthur. I arrived early in hopes of getting a seat (score!) as well as getting a chance to catch up with my friends, Neha and Nishant (pictured below with Andrei). 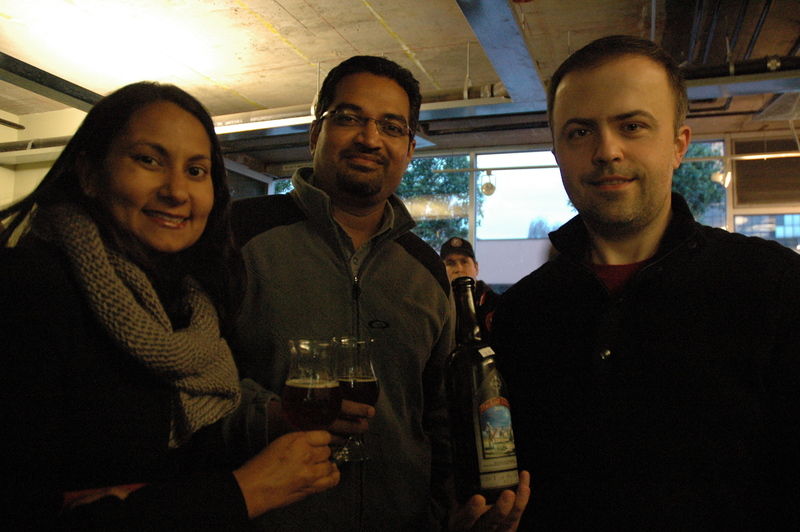 They couldn’t stay for the event but we shared a bottle of Lost Abbey’s Gift of the Magi, in honor of the event. By the time six o’clock rolled around, the place was getting busy. All the taps had been switched to Lost Abbey or Port Brewing beers (listed above in the picture up top) and we were making our way through them. All of them were delicious, and it was a treat to have some of the ones I’d had in the bottle, on tap. I’d say the favorite for me was still Angel’s Share, although the Cuvee de Tomme was a wonderful treat as well (for you sour lovers, this beer is for you!) 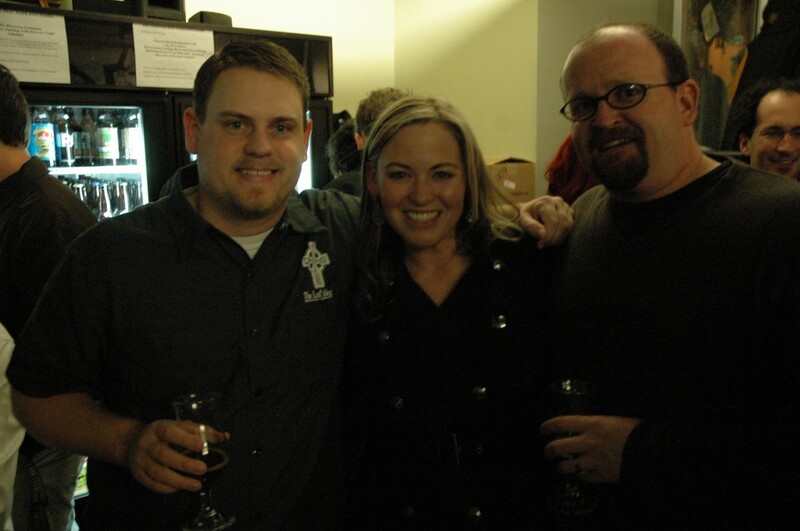 After a couple beers, I plucked up the courage to go talk to Tomme and Matt from the brewery. They were very gracious and I had really great conversations with both of them (hopefully without coming across as too much of a fan girl, LoL). By about 7:30 the event was buzzing and City Beer was at capacity for a bit (see below). Throughout the evening I had a chance to speak to many people, including Nate from Healthy Spirits (pictured below on the left). If you haven’t been to their store in San Francisco, go now! They’ve got an amazing selection of beers and I love them specifically because they are within walking distance of where I live. Overall the evening was probably my favorite of the week so far. 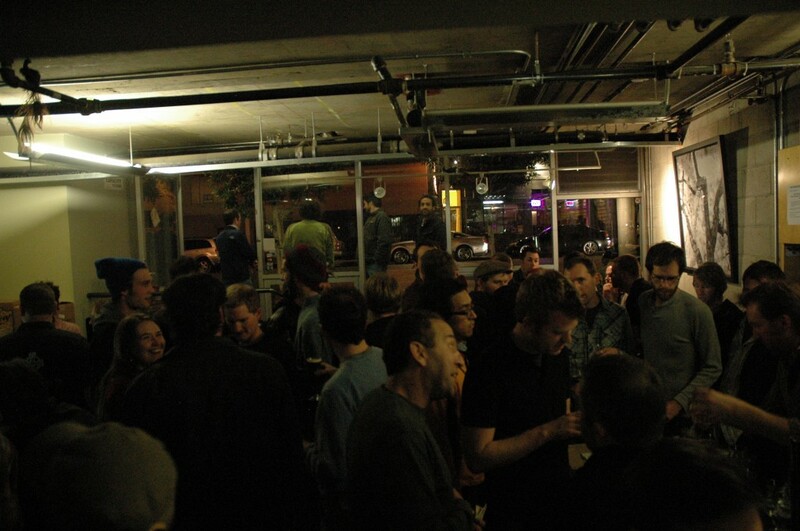 It was well organized, with great beer and people. Congrats to City Beer for putting it together and pulling off such a great event! And beer week continues. 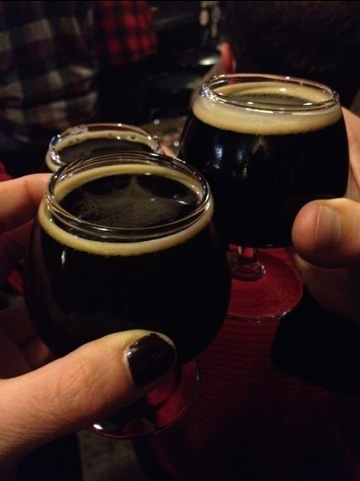 Saturday we headed to Beer Revolution, a relatively new beer establishment (they just had their one year anniversary!) 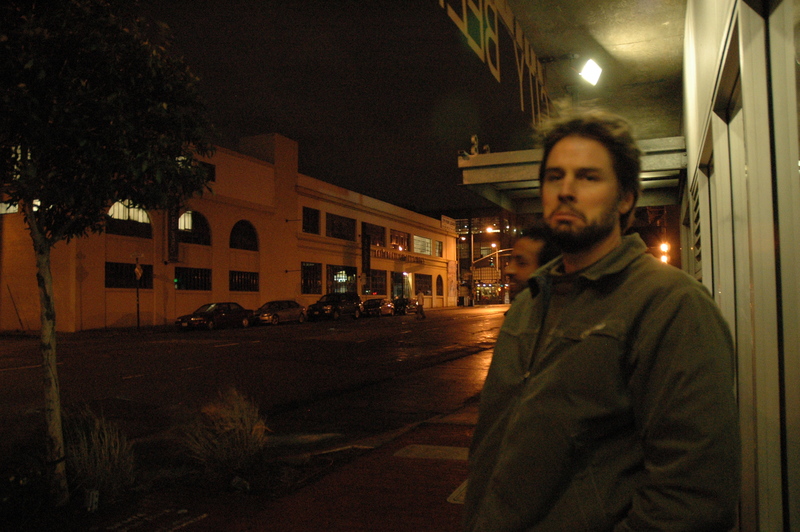 near Jack London Square in Oakland. They were hosting The Bruery’s “Meet the Brewer” event all day so we made sure to stop by there for a few hours prior to our next event. Andrei started out with the Oude Tart with Cherries while I opted for the 7 Grain Saison. Both of them we felt were at the lower end of the ABV spectrum (at 7.5% and 5.5% respectively) of the choices we were interested in, as well as not normally being available outside of the brewery. The Oude Tart (Flanders Red) was pretty damn impressive and a big hit showing in the fact that the keg was kicked about an hour after us arriving. The 7 Grain Saison was refreshing as a saison should be, but with a bit more hop flavor to the finish. Both were very enjoyable. We were lucky enough to snag seats at the bar which made getting service quite easy. Both outside and inside were packed with patrons, and Fraggle and Rebecca were working very hard but with so much patience. It was quite impressive. 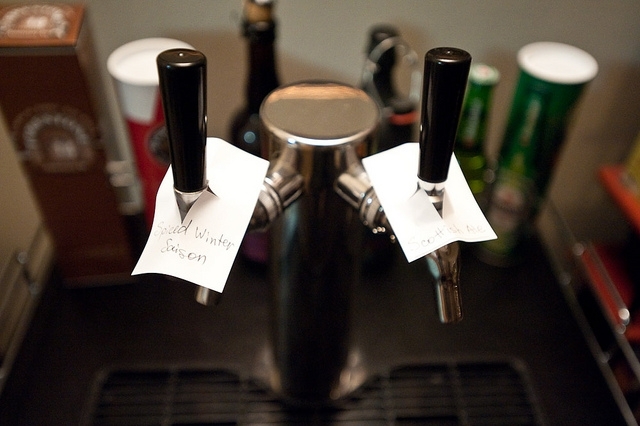 Luckily they had some help in getting everyone their beverages in a timely manner. 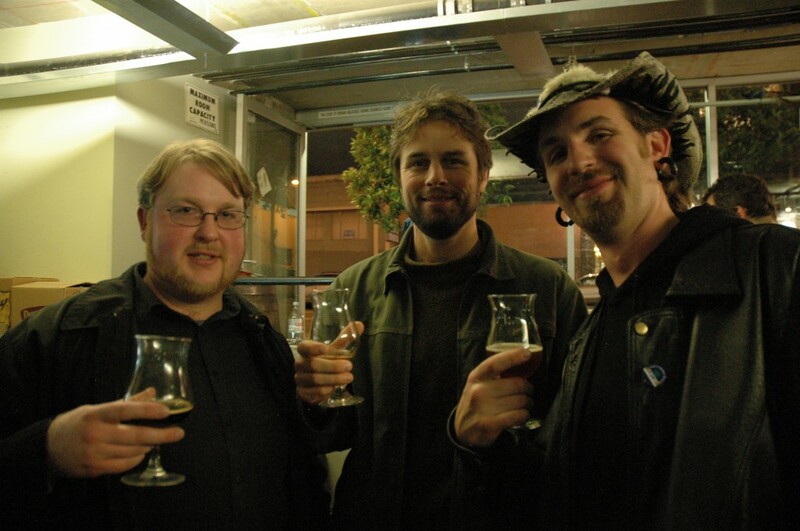 We also had time to chat with Jonas from The Bruery. We chatted about Orange County being a bit of a lonely place for beer (I went to University down there) and he agreed with our next choices of beer, The Old Richland Barleywine and The Dark Agave Quad. I must admit we didn’t care for these two as much as the first two but they were both still drinkable. After that we moved on to a couple beers from Moylan’s: 2011 Apple Brandy Barrel-Aged Kiltlifter and their Heaven Hill Barleywine. Both of these were super impressive and even though they were not from The Bruery, needed a mention. 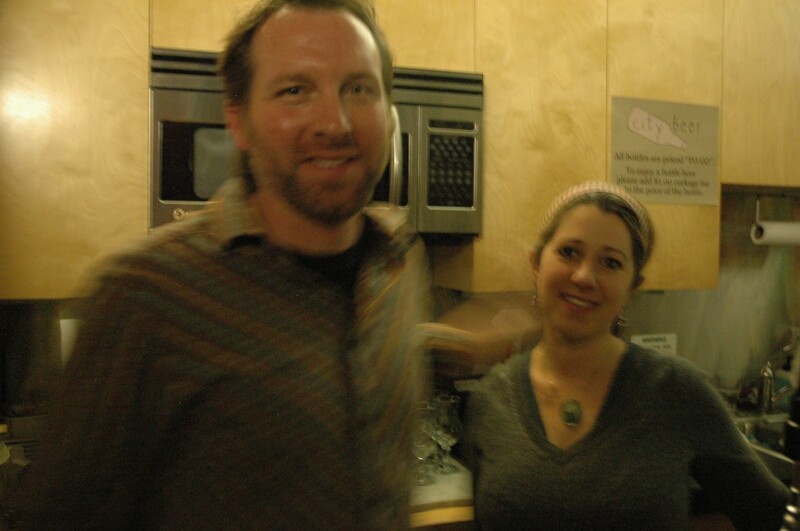 Later that evening we headed over to The Jug Shop for their, “It Came From the Wood” Barrel-Aged beer event. 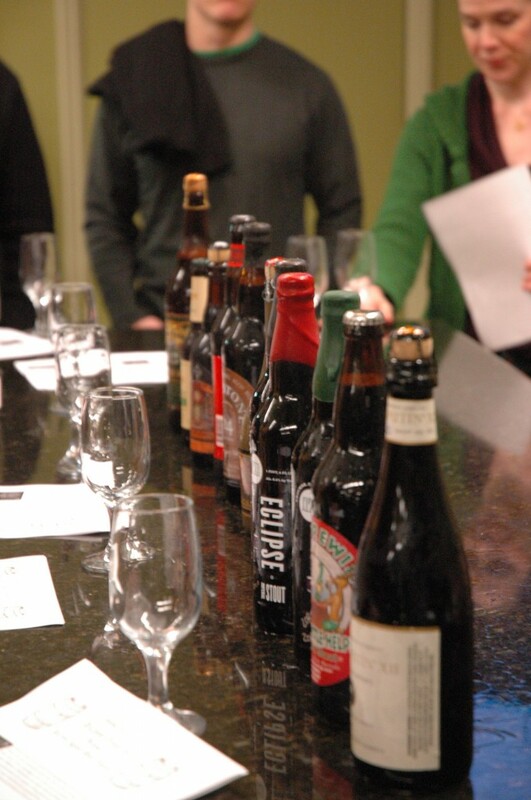 We had come here back in August for a Sour Beer tasting and really enjoyed the selection of beers. 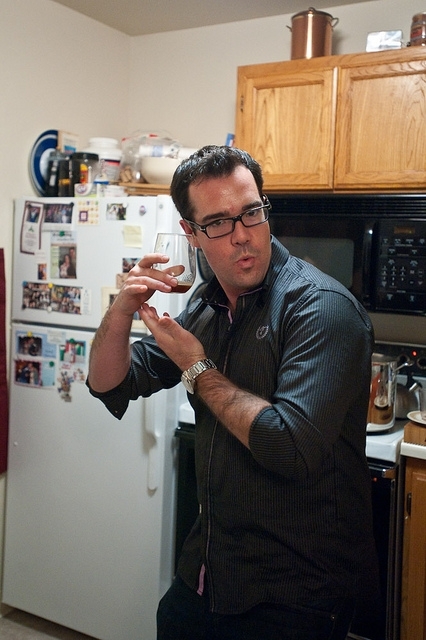 This night was no different with some stellar choices from Eric Cripe, the local Cicerone. 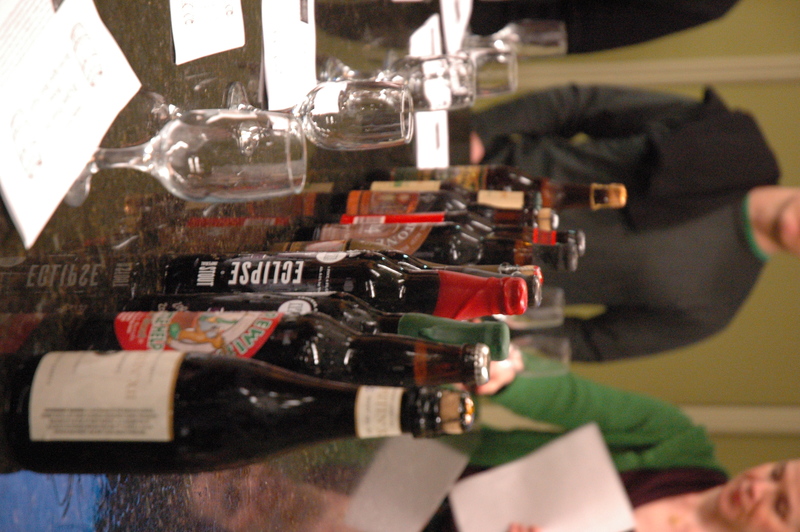 The 12 Barrel-Aged Beers lined up, ready to be tasted! We arrived shortly before the event started, and a good thing too! I was shocked with how many people showed up for this event. I think by the end of the evening, there were at least 60 people, which is a lot for this shop to handle. But Eric did a fine job, somehow remembering where people had left off. The highlights of the event for me were North Coast’s Old Stock Reserve, Firestone Walker 14 and Port Brewing’s Barrel-Aged Santa’s Little Helper. We tried three different versions of Fifty Fifty’s Eclipse Imperial Stout, two from 2010 (Evan Williams and Four Roses) and one from 2009 (Heaven Hill). For as expensive as these guys are, I wasn’t too impressed. The Heaven Hill was the only one that I felt really had a good flavor to it and warranted the cost. Post Mortem....a lot of beer was tasted. This was a fun way to end our second day of SF Beer Week. Both events we went to today were well planned and had great brews. For you locals, The Jug Shop and Beer Revolution do tastings/events pretty regularly, so check out their calendars for upcoming events. 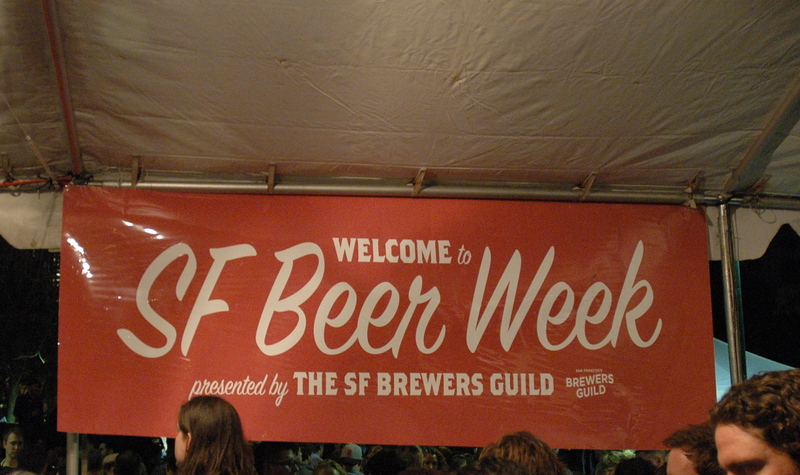 San Francisco Beer Week is finally upon us! I remember going last year to a few events and being in awe of how many beer lovers there were in the bay area. This year it expanded even more and I was there to witness it firsthand at the Opening Night Gala. Once inside, the event was enjoyable. There was a great show of breweries, some local and some from other areas of California; all the SF Breweries such as 21st Amendment, Social Kitchen and Brewery, Speakeasy, Magnolia, Thirsty Bear as well as other “local breweries” such as Linden Street, Iron Springs, Moylan’s, Marin, Russian River, Lost Coast, Eel River, Lost Coast, etc….the list goes on and you can check out their website to see who was there. As is the case with most beer galas/festivals, the actual selection of beer ranged from great to horrible with a median of “just okay”. 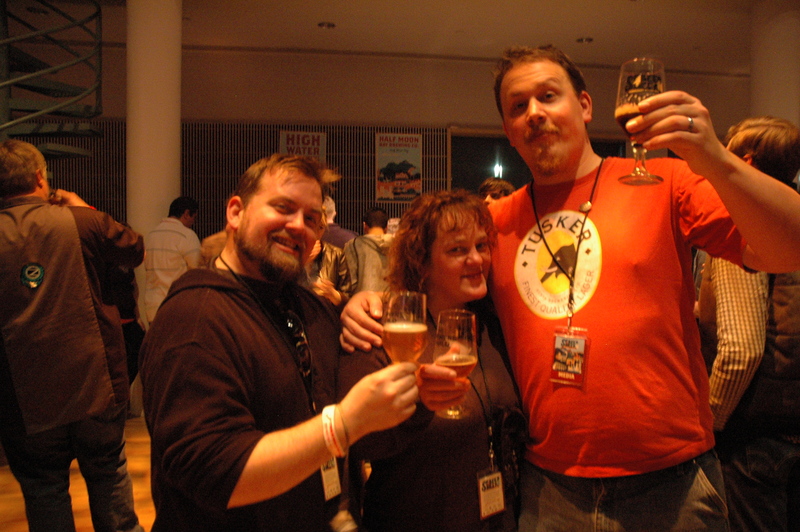 The highlight for me was probably Bunny’s Toe from Triple Rock Brewery over in Berkeley. It’s an American Style Barleywine that had a really lovely toffee smell/flavor and a well balanced hops characteristic to the malt. I’m embarrassed to say that I’ve actually never been over to Triple Rock Brewery, although that will change later today when I go over for their Sour Beer Event. Highlights of the event for me? 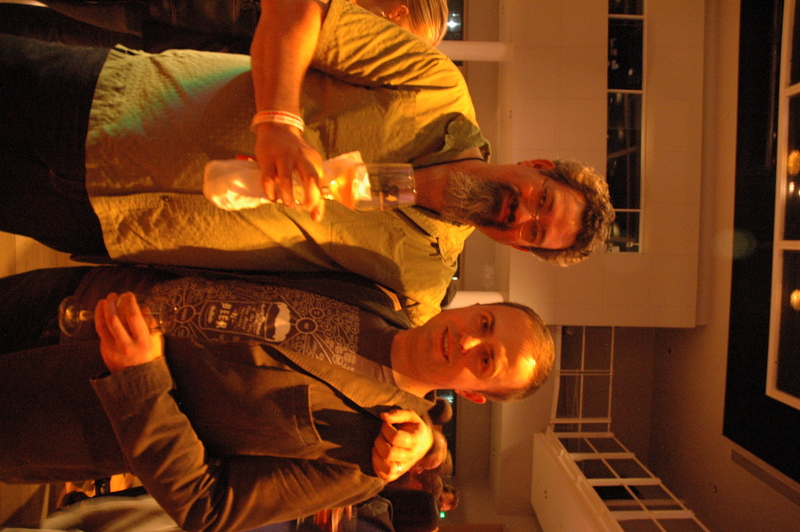 Mostly just hanging out with awesome people, which included meeting Sean Paxton (pictured below with Andrei) as well as the guys from Mission Gastroclub (who strangely seem to be following us from event to event…hehe). I also got to meet a few folks from my Bay Area Beer Bloggers group – so nice to put faces to names (also pictured below). Overall, the gala was a lot of fun and I look forward to the event next year….hopefully in a bigger venue! A thought occurred to me a few weeks ago about how there are so many good holiday/winter beers out there and how I’d never tasted more than one of them at a time. 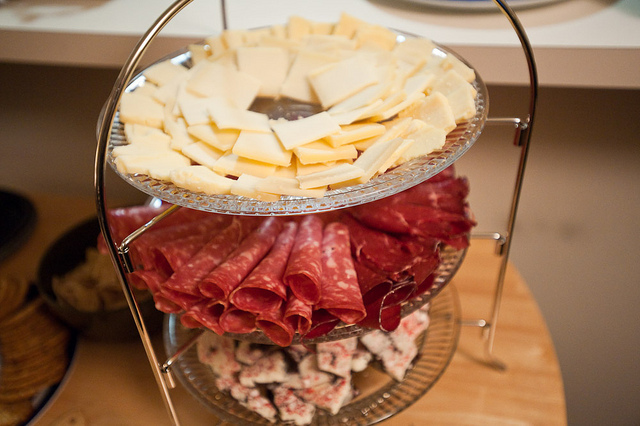 Wouldn’t it be fun to incorporate a tasting into a holiday party for my friends? And so I did. I wasn’t too particular on which kind of beer we would have because I knew most of my friends wouldn’t be serious about the tasting part, more about the drinking and celebrating part. but I wanted to get a few I knew and a few I didn’t. Others brought some goodies to share as well (thanks to those who did) and we ended up having quite a large amount of food! 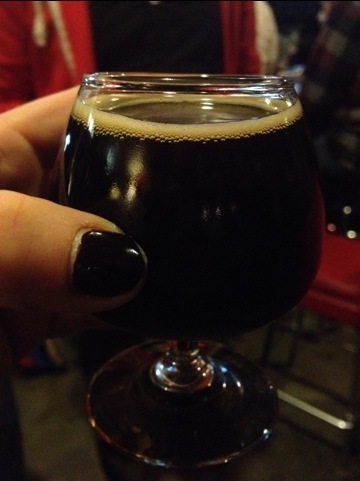 We started off with a local beer, 21st Amendment’s Fireside Chat (Winter Warmer/7.9% ABV). I had this a few weeks back at a FoodBuzz event and I remember really liking it. After trying it again, I think maybe I wasn’t quite as impressed as I was when I first drank it. Don’t get me wrong, it’s a decent beer. Lots of spice but it’s a bit one dimensional and lacked some depth. 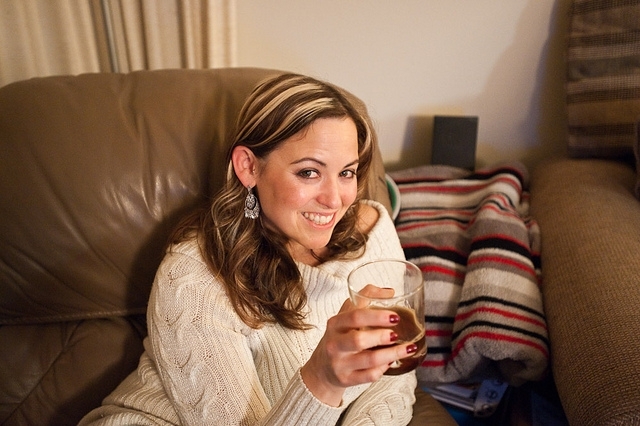 Our second beer was another local brew – Marin Brewing Comany’s Hoppy Holidaze (Winter Warmer/7% ABV). I was actually expecting this to be quite hoppy, what with a name like that. But it wasn’t overly hoppy. It had a very good balance and I really enjoyed it. I also felt like this was probably the most enjoyable beer of the night for the group as a whole. See below how Mr. Van Loan feels about it. Our third beer ( Nøgne Ø’s Peculiar Yule/Spiced Beer, 6.5% ABV) was a bit of a wild card as I hadn’t tasted it prior to the event but it had decent ratings from what I could tell. I was intrigued because it said that it drew some inspiration from Norwegian drink “gløgg” which I had tried for the first time last Christmas. 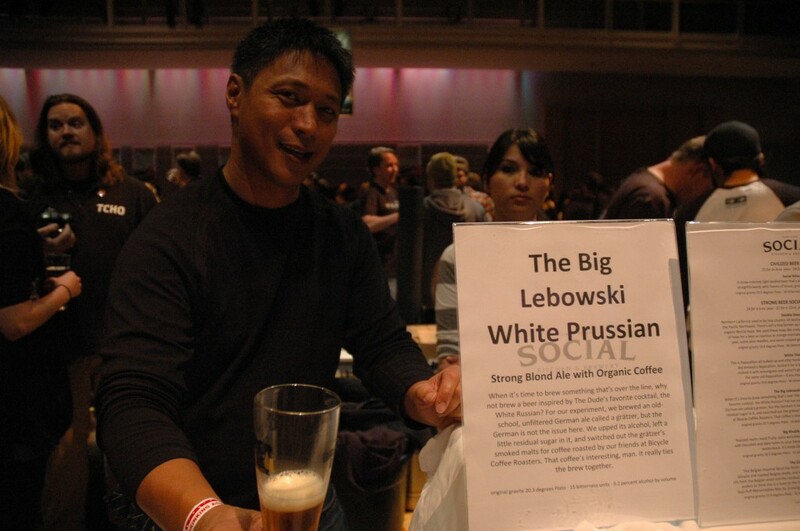 I think this was the most surprising beer for everyone, especially those who hadn’t had a spiced beer before. For most, the flavor and smell was overwhelmingly spicy. I didn’t get the gløgg taste I was expecting, but then again, it’s a beer and not gløgg! 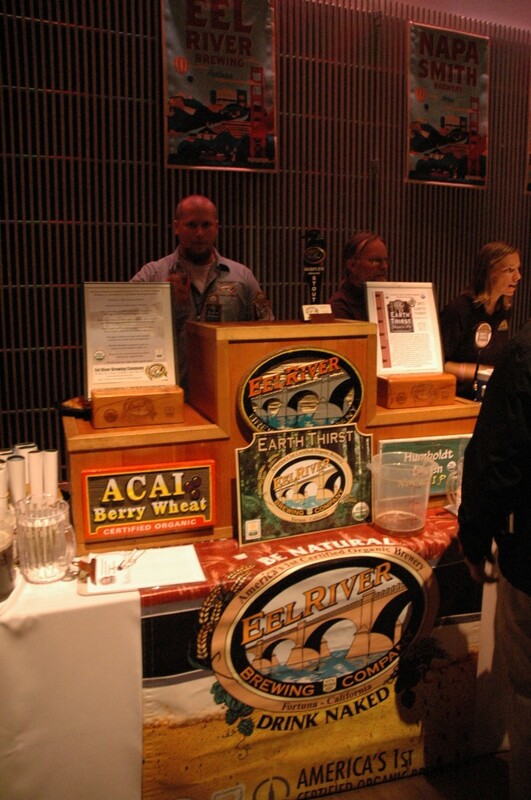 But it was definitely interesting and you should check it out if you are into trying different types of beers. We ended the tasting with He’brew’s Jewbelation Fourteen (American Strong Ale, 14% ABV). 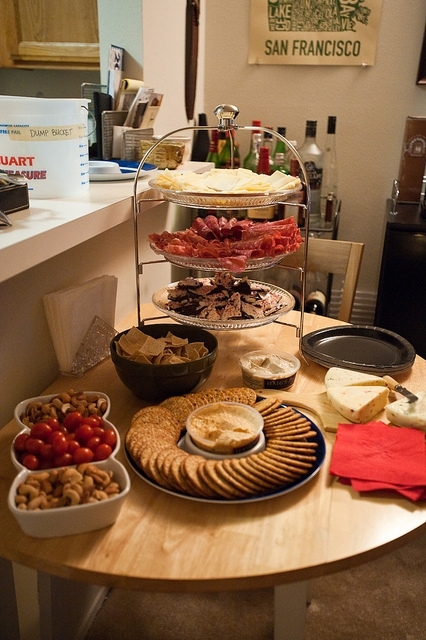 I had tried this a few other times and really enjoyed it and was hopeful my guests were as well. 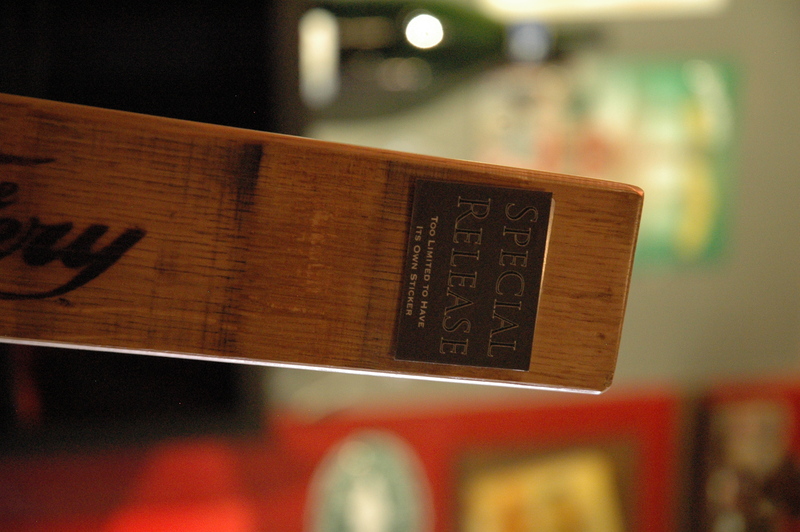 This one packs a punch at 14% ABV which is why we waited for it. It’s a big beer but doesn’t have a strong taste of alcohol. Rich, malty and sweet, you get a lot of chocolate and mild spice notes. My favorite of the night although I think many people were beered out by this time. Suki shows us that she can only take a little of this monster of a beer! 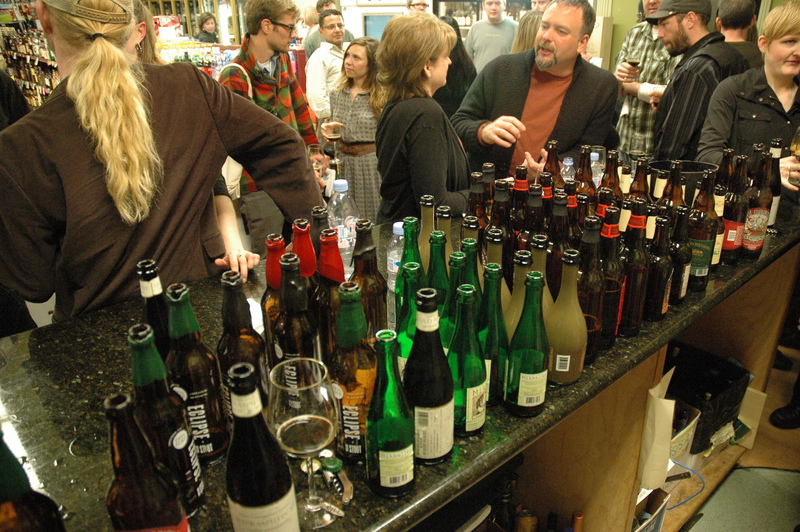 All in all, a fun night was had with wonderful friends and lots of other tasty beers. 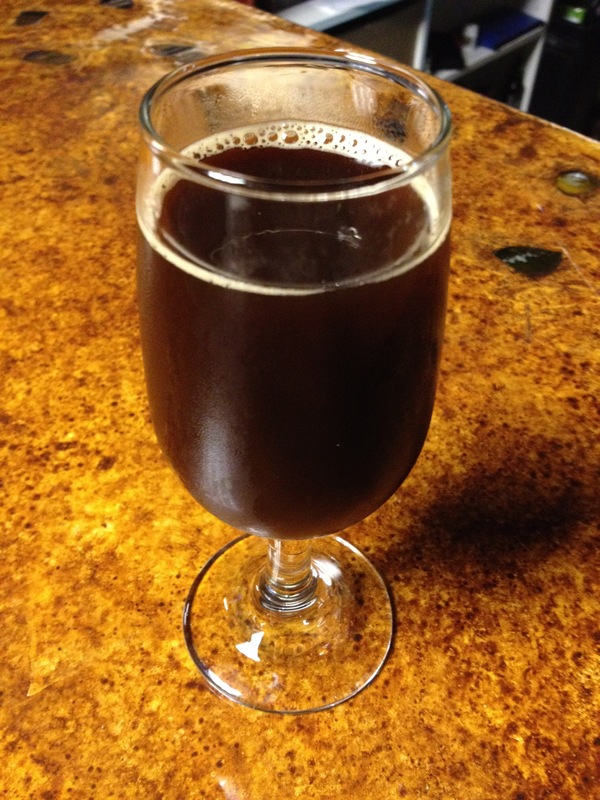 Highlights were definitely Andrei’s Winter Saison and Scottish Ale that he brewed himself! Thanks to all of my friends who made it out for this little event. I had a wonderful time and I hope you did as well. Of all the beer drinkers in the world, there are very few who probably care to really sit down and review/rate a beer. They either like it or they don’t. But for those of us that are really interested in delving deeper into beer itself, there is an official way most beer reviewers rate beer. While I generally don’t write my reviews out this way, they are definitely things I consider when rating a beer and so I wanted to educate you, dear reader, on what all of this means. Maybe it’ll have you thinking a bit more about the beer you’re drinking next time you’re in your local tavern. So let’s start with appearance. Appearance should be straight forward. What does it look like? Light? Dark? Is it cloudy? Carbonated? Everything that has to do with the look of the beer should be noted. I notice quite a few wine drinkers taking time to smell the wine, but rarely do I see beer drinkers take the time to smell before drinking. So make sure you pause to smell: do you smell the hops? Or the yeast? What about underlying smells such as caramel or cocoa? Does it have a floral aroma? 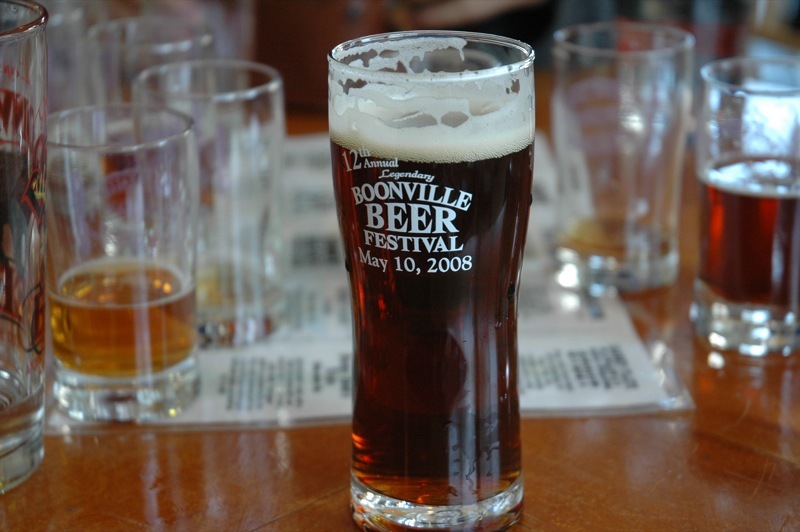 There are so many things that can be noted just by taking time to smell the beer. This was probably the hardest for me to recognize at first as texture (or mouthfeel) isn’t something I usually associate with liquid. 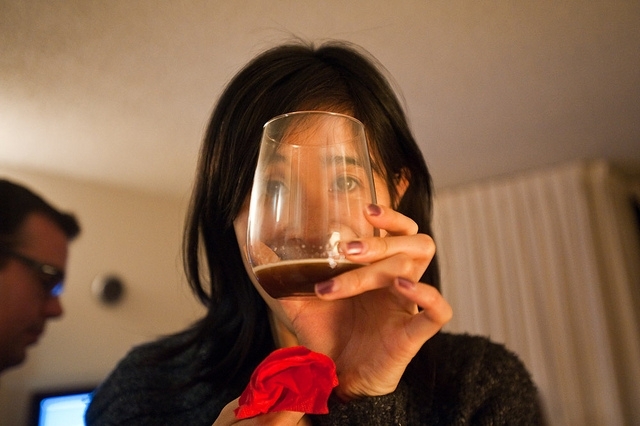 But for me it is recognizing how it feels on the palate. Light or heavy? Smooth or rough? Flat or carbonated? Take the time to really feel the beer before you swallow. This is probably the most subjective aspect of rating beers. In a few words, would you drink this beer again? 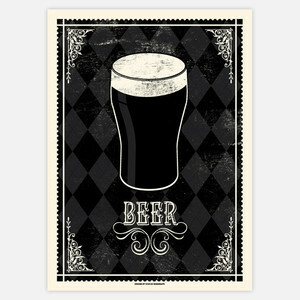 Is it something that you could consume pint after pint of, or should it be consumed in small quantities? Or not at all? I think the most important part of rating or reviewing a beer is to not be influenced by other opinions. If you’re at a table where everyone seems to love a beer that you don’t, don’t assume you should love the beer. Everyone’s experience and palate is different. So stay true to your thoughts and don’t assume that your opinion is invalid if it’s unpopular. I hope this has been helpful for my fellow novices out there…next time you drink a beer, think about these things I’ve talked about and see if you’re able to pick up on it. If anything, it’ll be a slightly different beer experience for you. At some point I will review beers that I find less than fabulous…but this is not one of them. Last week I made it back over to The Trappist in Oakland after a hiatus of several months (shame on me!). 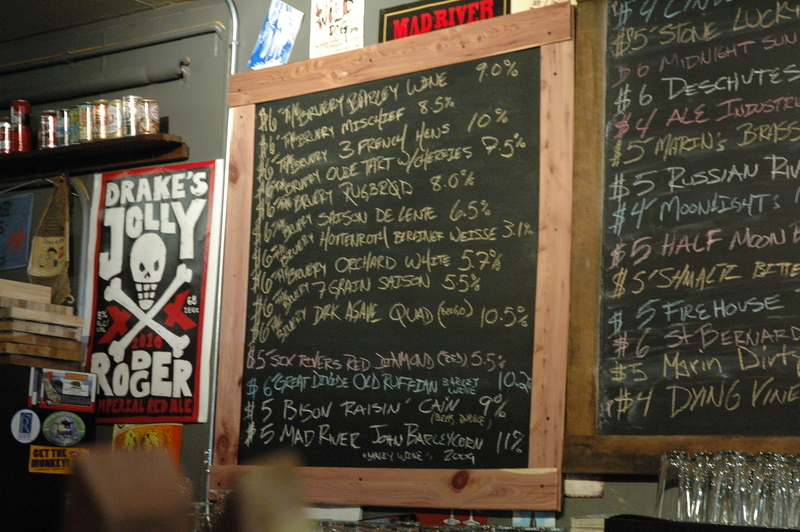 As always, there was an amazing selection of beers not only on tap, but also bottled. 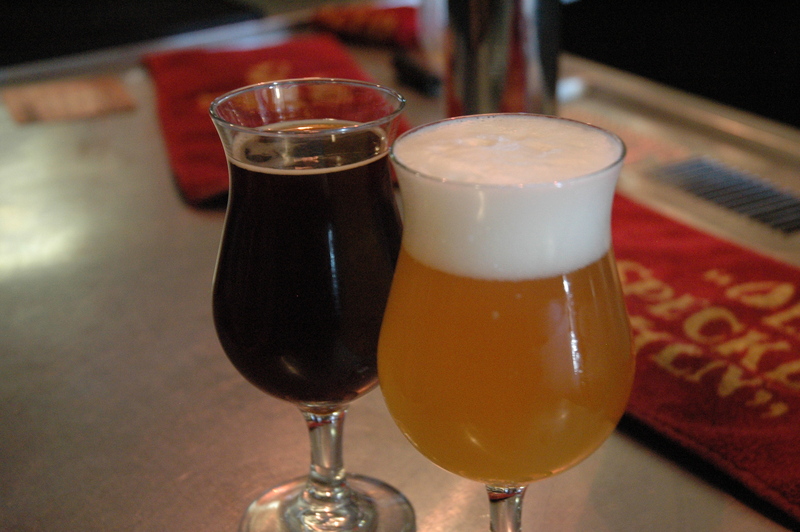 The Trappist is definitely one of the best beer bars in the bay area. 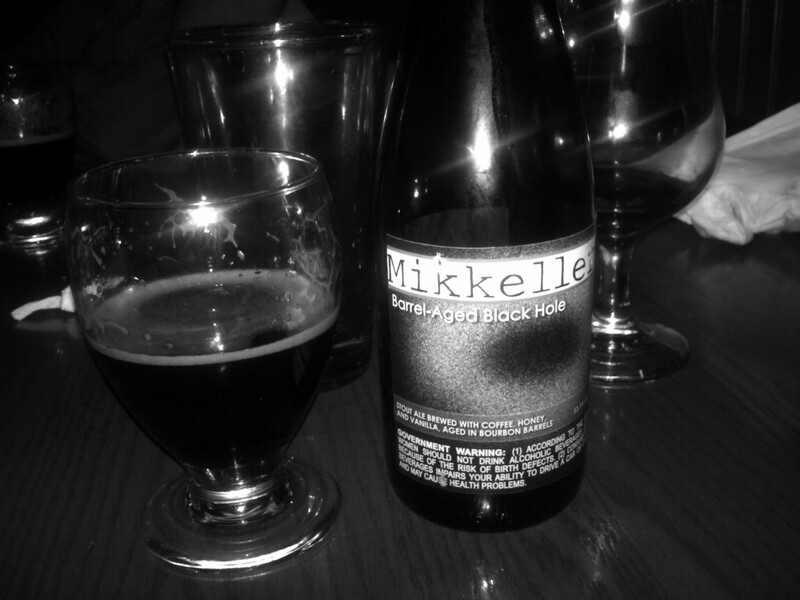 But I digress as I’m here to speak specifically about a beer I had that evening, Mikkeller’s Barrel-Aged Black Hole. I had tried Mikkeller’s Black Hole a few months back and found it to be a delicious example of an imperial stout. 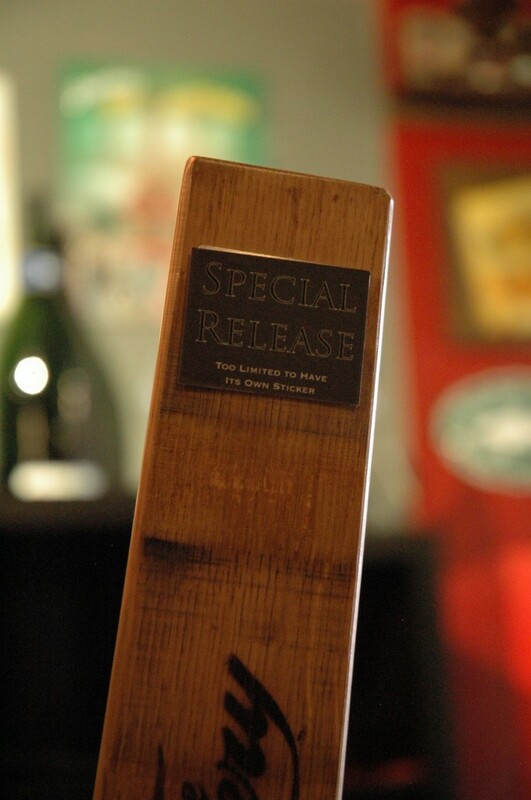 Add that to bourbon barrels and age it…it takes it up a notch! 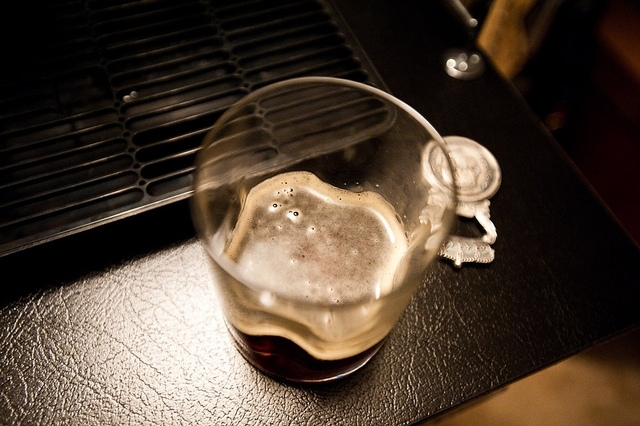 The beer itself appeared very dark in color with a slight caramel colored head. The bottle states quite clearly, “brewed with coffee, honey and vanilla”. I could definitely smell and taste the coffee and vanilla (oak barrels tend to give off a vanilla flavor and smell) but not so much of the honey. The finish is creamy and smooth which makes it very drinkable, although I would say it isn’t quite as smooth as some other barrel-aged beers I’ve had…but that may be due to the age (better to age). If you happen upon this beer, definitely worth trying. If you happen to see it in a store, buy it and age it for a while as it will only get better. Four out of five pints!